Today, courtesy of the Littlebury Brothers, we take a guided tour through the Picton Library, Brown Reading Room and Museum as they were in 1902. In view of the fact that before many months, possibly weeks, portions of the New Technical College and Museum building will be opened, great alterations are taking place in every department. It is therefore impossible to say that the present arrangement of exhibits will hold good for a great length of time. We will, however, give the visitor a general idea of what is to be seen in the Museum. 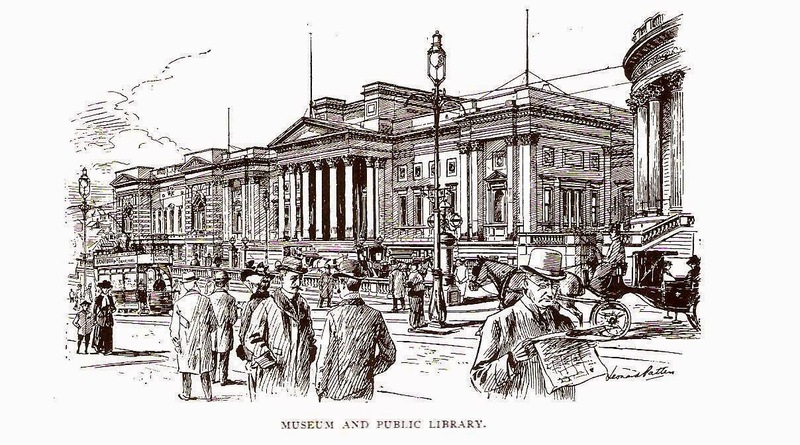 Many years ago there existed in Liverpool a small Museum in which was shown a collection made by the 13th Earl Derby. Derby's The present Museum was built by Sir Museum William Brown, a Liverpool merchant (whose portrait we referred in the “Brown Reading Room), at his sole expense, and opened in i860. Earl Derbys exhibits were then placed in this building. We first enter the “ Derby ” Museum. This “Derby” chiefly comprises the Natural History Section of the exhibits. Here we have well set up specimens of the British barn owl, sparrow hawk, nightjar, heron, moor hen, rock pigeon, and other well-known birds. Here, at the opposite side of the Landing, is a fine fossil tree (palm), which was found at a Wigan coal pit. Interesting Galleries are these “ Bird ” rooms, which surround the Central Mayer Museum. Notice in these the Albatross and Frigate Bird, and the Giant Crab from Japan. Middle Floor Central Mayer Museum. This is full of interesting exhibits. Joseph Mayer’s “Personal Relics,” amongst which we note, “ Boots and Gloves worn by King Henry VI. after the Battle of Hexham, May 15th, 1463;” Cap and Gloves worn by Lord Byron in Greece ; Walking Cane of William IV. ; Bobby Burns Candlestick and a Crosby Race Card for 1777; the Bonaparte curiosities ; fine Miniature and Revolutionary Badges; magnificent Ivories, Diptychs, and work of 7th to 11h centuries, Byzantine, Carvings German, and Anglo-Saxon; work of 14th to 16th centuries, English, German, French, and Spanish ; also Indian, Chinese, Japanese, and Persian carvings. Armorial Badges, Seals, etc. ; Pilgrims’ signs; Enamels on copper, limoges, 11th to 13th centuries; beautiful mediaeval Manuscripts, and illuminated “ Breviaries,” “ Books of Hours,” and Psalters. In addition to these, the Rolfe and Faussett collections of British antiquities; (Mr. Mayer’s Coin Box is in this section) a very fine Exeter Clock ; and a collection of Japanese Armour, Oriental Glass, and some musical instruments. Ground Floor Central Mayer Museum. Here we go back to Ancient Egypt, Greece, and Rome; we are surrounded by Mummies, Sepulchral Tablets, Vases, mummified Cats, small Crocodiles, Hawks, and various sacred animals. Chief amongst the exhibits is the massive red granite Sarcophagus of Bakenhonsu, 1,200 B.C. ; on the lid is a figure of the goddess Mut, with prayer and dedication ; at the sides, lower down, the god Thoth and the genii of the Amenti are represented. Note also the Sepulchral Tablet with dedications to Osiris and Anubis for Tutankh; portrait head and Cartouche of King Rameses II., 19th Dynasty, B.C. 1324-1219; a Coffin in scyamore wood, time 25th Dynasty; a marble slab, with footmarks of Pilgrims to a sacred shrine; fragments of Papyrus ; Greek Vases ; sculptures and pottery from Cyprus ; Roman and Greek antiquities and Sepulchral Urns; and Phoenician glass. From this Ground Floor Museum we pass to The Aquarium, and to the Ethnographical Gallery, in which are seen some relics of the John Franklin Expedition; amongst them a tracing of “The Record of the Expedition,” found in a cairn on Point Victory, framed in wood made from the Franklin boat found on the shores of King William Island, and a piece of copper from the same. In this Gallery we see the implements for war and for sport of the world’s inhabitants, from New Zealand to the Arctic Regions. The Esquimaux in his furs, and the native of the Torrid Zone in his feathers, hideous fetishes of uncivilized man, and the Maori with his disfigured tattooed face, are all represented. In fine, we notice curiosities from all parts of the world. A word in conclusion about the Technical Schools. This building has been erected from the design of Mr. W. Mountford, at the junction of Byrom Street and William Brown Street, at a cost of £100,000. 'The upper floors are to form an addition to the present Museum, and the other rooms will be used for various classes, etc., in connection with the College.